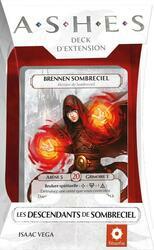 In this new expansion for Ashes, discover Sombreciel, the venerable city that stands at the top of the world. There reigns Brennen, a 15-year-old boy capable of using the unforgivable magic of blood. Motivated to regain his lost heritage, he left to restore the terrifying glory of his lineage and his city. A new Heir and his prebuilt deck. 10 new spells and 1 new conjuration. Be careful this game is an extension of Ashes: Les Héritiers du Phénix and cannot be played alone. To be able to play it you must have a copy of the game Ashes: Les Héritiers du Phénix .